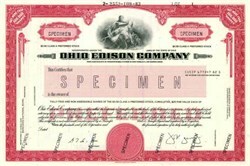 Beautifully engraved SPECIMEN certificate from the Ohio Edison Company. 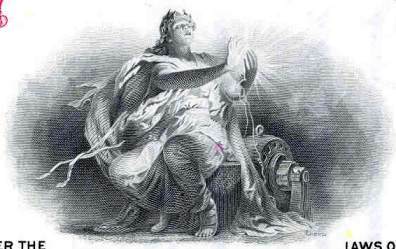 This historic document was printed by the Security-Columbian United States Banknote Corporation and has an ornate border around it with a vignette of an allegorical woman sitting on a generator. This item has the printed signatures of the Company’s President and Secretary. FirstEnergy Corp. is a registered holding company headquartered in Akron, Ohio. Its seven electric utility operating companies comprise the nation's 4th largest investor-owned electric system, serving 4.3 million customers within 36,100 square miles of Ohio, Pennsylvania and New Jersey.